"Old Avon Theater, Savannah GA" by George Lansing Taylor Jr. The Avon Theatre was built in 1944 and closed in 1970. The auditorium was demolished, but the entrance building still sports the avon's marquee. 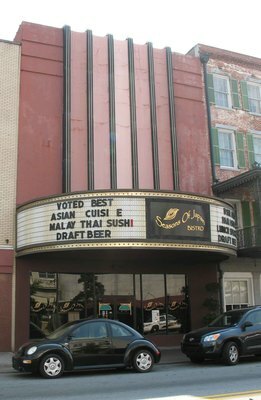 The building was in use as the Seasons of Japan Bistro, a Japanese restaurant in 2007. The City Lights Theater Company, permanently housed in the newly renovated Avon Theater. The Old Avon Theater In the Savannah Historic District, National Register #66000277, and also a National Historic Landmark. Taylor, George Lansing, Jr.; Lance Taylor; Photographers -- Florida --Jacksonville; Photograph collections -- Florida -- Jacksonville; Old Avon Theater; Seasons of Japan Bistro; Restaurant; Historic landmark; Historic district; Chatham County (Ga.); Theaters --- Georgia --- Savannah.